2. Wash potatoes and slice into chip shapes, then place on baking tray, drizzle with olive oil and season with a pinch of salt and pepper. 3. Place baking tray in oven for 45 minutes. 4. Next, remove tofu from packaging, drain and gently squeeze out as much water as possible. To press the tofu, cover it on both sides with a kitchen towel and place a weight on top, such as a can of beans. 5. Meanwhile, prepare batter mix by combining 1/2 tsp salt, 1/2 tsp pepper, garlic powder, flour, ale and baking powder in a mixing bowl. 6. Cut tofu into 4 pieces and season each side with salt and pepper. Next, line one side of each piece with a slice of nori. Use scissors to cut the nori, if required. 7. Heat roughly 1/4 cup of oil in a frying pan on a high temperature. Wait until the oil is very hot before dipping each tofu slice into the batter, shaking gently to remove any excess mixture, and placing into the frying pan. 8. Fry tofu on all 4 sides for 2-3 minutes. 9. Serve half the chips with 2 slices of tofu and a couple slices of lemon. 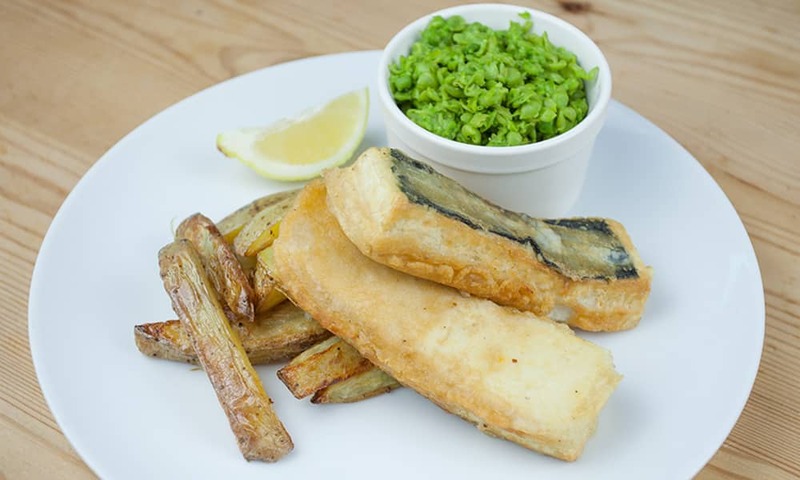 We recommend serving with mushy peas! How long will the batter keep for? Do you have a cook book containing these recipes ? Why wouldn’t you have dusted it with plain flour first, before dipping in the batter? It would adhear so much better. Thank you. I made it with GF flour to cater for vegan celiac. He was amazed. This was fabulous,.